Manifesting the Raine Inc. mindset of LIGHTER FASTER STRONGER, the new R2 combines functionality and scalability into a manageable, 2800 cubic inch pack system. While wheels have not been re-invented in Raine’s first ever ruck sack platform, good sound functional features and modularity were built into this pack to carry your load comfortably and efficiently. 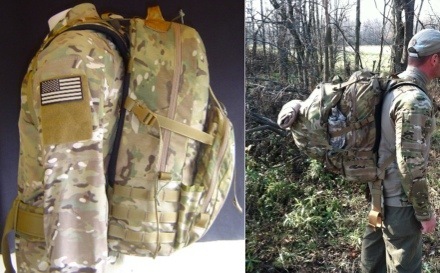 “Running this pack in the field recently allowed me to test some of the purpose built features we were driving at in the design phase. At the end of the day, what is it that I need my pack to do for me? The simple answer is to carry a load, carry it comfortably, and allow me to do it in a manner in which I never have to fight the load. This pack carried a pretty hearty load and did it very comfortably thanks to the strategic placement of the shoulder and waist suspension. This pack is Made in the USA. Click here to learn what this means. Look for Raine to unveil this pack, along with a number of other duffels, purpose built specialty packs, load out bags, new belts, navigation platforms, and new armor systems at the SHOT Show coming up in January 2013. For more information on the R2 Ruck go to http://raineinc.com/catalog/product_info.php?products_id=1391 For a complete list of Raine’s products, go to http://raineinc.com. Click here to become a fan of Raine’s on Facebook and receive 10% off your online order. This entry was posted in Raine's Products and tagged military gear, military products, Raine military products, Raine new product, Raine R2 military gear by raineincblog. Bookmark the permalink.